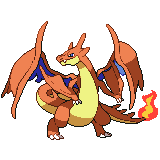 Would this moveset work for Mega Charizard Y? My Charizard Y has same moves but instead of D-Pulse I have Wing Attack. Earth Quake:Charizards biggest weakness electric gets rekt by this move rock too. Dragon Claw: Charizard can easily be beaten by dragon types but dragon claw gives it a chance if you have max speed and alot of health you can get rid of dragon types. This IS MY CHARIZARD'S MOVE SET its not chosen by public this is the best move set in my opinion. Dragon Dance allows Charizard to boost its Attack and Speed simultaneously. Dragon Claw is a powerful STAB attack that is boosted by Tough Claws. Flare Blitz is a nuke able to take on Steel-types, which resist Dragon Claw. Roost improves Charizard's longevity, eases setup, and allows it to stay out of range of revenge killers. Earthquake is an option to deal great damage to Tyranitar and Toxapex as well as OHKO Heatran. now these moves are best used with mega charizard X because fire fang, shadow claw, steel wing and iron tail are contact moves, which gets boosted with the ability tough claws. Why does Charizard-Y have Psychical moves? This is a realy OP recipe for Mega Charizard that I found on every single game. WARNING: DO NOT COMPLAIN BEFORE TRYING!!! Nature: Jolly (-SpA;+Spe); Evs: 252 Atk; 252 Spe; 4 SpD. Nature: Timid (-Atk;+Spe); Evs: 252 SpA; 252 Spe; 4 Def. So here's some tips: Do not let Y fight against any faster Water or Rock type Pokemons even when he have Solar Beam. Also X can handle a Rock Slide, but not an Earthquake, so be careful! We have to look at 2 different Mega Evolutions of Charizard! It won`t be an easy task but I,ll try my best! I'm the sort of person who always likes power. fire pledge/heatwave: for working together with grass pledge/ or striking all enemies. i'm sure that's a op charizard! heat wave: works like blizzard. hits all enemies but not your allies like surf does! earthquake:hits all enemies and 100 accuracy and 100 power! i think that's a pretty good charizard! moves fire pledge: to work together with grass pledge! earthquake: to get a big advantage against rock/electric type pokémon. iron tail/dragon pulse: iron tail to sweep eventual fairy types or dragon pulse to KO the most dragon types. Special Mega X set anyone? See, everybody expects him to be a pshysical attacker, so they switch to a physical wall. And then you OHKO them with flamethrower! No the point is that they expect him to be physical which he isn't therefore you can possible score a free KO on one of their Pokemon. No the point is that they expect him to be physical which he isn't therefore you can possiblyscore a free KO on one of their Pokemon. No the point is that they expect him to be physical which he isn't therefore you can possibly score a free KO on one of their Pokemon. What is Focus Blast even for other than failing to stop Belly Drum Snorlaxs?